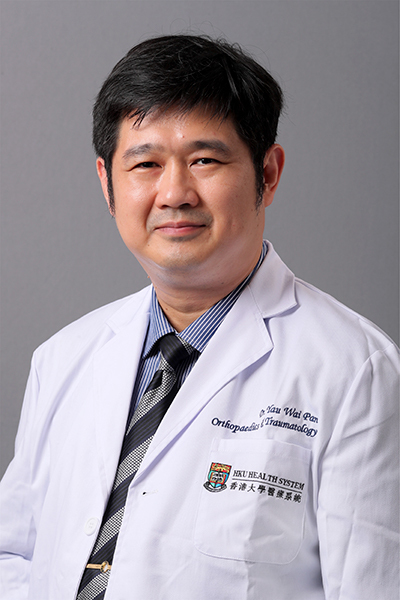 Dr. WP Yau is the Chief of the Division of Sports and Arthroscopic Surgery and Clinical Associate Professor of Department of Orthopaedics and Traumatology in the University of Hong Kong. Dr. Yau started his medical education in the Faculty of Medicine of the University of Hong Kong in 1987. Dr. Yau earned his medical degree in 1992. After completing his medical internship in 1993, Dr. Yau began his general surgical training in Queen Mary Hospital of Hong Kong and obtained the Fellowship of Royal College of Surgeons of Edinburgh in 1997. Dr. Yau was then enrolled in the Higher Orthopaedic Training in the Department of Orthopaedics and Traumatology, Queen Mary Hospital. He finished his orthopaedic residency training in 2000 and passed the fellowship examination in the same year with flying colour by being the gold medalist of the conjoint examination. Dr. Yau was awarded the Fellow of the Hong Kong College of Orthopaedic Surgeons and Fellow of the Hong Kong Academy of Medicine in 2001. Dr. Yau joined the University of Hong Kong in 2007. He was appointed as the Chief of Division of Sports and Arthroscopic Surgery in Queen Mary Hospital in 2008. Dr. Yau was elected to be the Chapter President of Sports Medicine Chapter of Hong Kong Orthopaedic Association in 2012, the Chief Censor of Hong Kong College of Orthopaedic Surgeons in 2015 and the President-Elect of Hong Kong College of Orthopaedic Surgeons in 2017. Dr. Yau was appointed as the Clinical Associate Professor of the Department of Orthopaedics and Traumatology, the University of Hong Kong and the Honorary Clinical Consultant of Hospital Authority of Hong Kong in August 2013. Dr. Yau was appointed as the deputy editor (shoulder and elbow) of “Clinical Orthopaedics and Related Research” in 2017. Dr. Yau specializes in Sports Medicine and Adult Joint Reconstruction Surgery. His major research interest lies in clinical outcome studies on these two areas. This had led to the publication of over 60 peer-reviewed articles, 1 book chapter and 90 conference papers. Dr. Yau has delivered more than 70 invited lectures, both locally and internationally, and given close to 160 presentations in both national and international conferences. Dr. Yau received the Author Yau Award of Hong Kong Orthopaedic Association in 1994 and 2004, David Fang Trophy of Hong Kong Orthopaedic Association in 2004, Harry Fang Gold Medal Award of Hong Kong College of Orthopaedic College in 2000 and Japan Orthopaedics and Traumatology Foundation Fellowship Award in 2008, Best sports medicien paper award of Hong Kong Orthopaedic Association in 2010 and 2016 and Orthopaedic Basic Science Award of Hong Kong Orthopaedic Association in 2014. Dr. Yau was selected to be the Ambassador of the Hong Kong Orthopaedic Association to Japanese Orthopaedic Association Annual Congress in 1995 and 2005, New Zealand Orthopaedic Association Scientific Meeting in 2003 and 2005, and Singapore Orthopaedic Association Annual Congress in 2006 and 2008. Dr. Yau received the honor of “Top reviewers” of Clinical Orthopaedics and Related Research in 2015 and 2016. Dr. Yau is active in providing orthopaedic education to the orthopaedic trainees, both locally in Hong Kong and internationally. He was appointed as the Training Director of the Department of Orthopaedics and Traumatology, The University of Hong Kong since 2008 and served as a member in the Education Subcommittee of the Hong Kong College of Orthopaedic Surgeons from then onwards. He was appointed as the Convener of the Basic Orthopaedic Bioskill Workshop under the Hong Kong College of Orthopaedic Surgeons in 2009 for a 5-year term. Dr. Yau was elected to be the Deputy censor of Hong Kong College of Orthopaedic Surgeons in 2013, the Chief censor of Hong Kong College of Orthopaedic Surgeons in 2015 and the President-Elect of Hong Kong College of Orthopaedic Surgeons in 2017. Dr. Yau is a member of Educational Day of SICOT Educational Day since 2013 and is subsequently appointed to be the chairman of SICOT Educational Day in 2018. Prevalence of Radiographic Parameters Predisposing to Femoracetabular Impingement in Young Asymptomatic Chinese and White Subjects. JV Houcke, WP Yau, CH Yan, W Huysse, WH Lau, CS Wong, C Pattyn and EA Audenaert. Journal of Bone and Joint Surgery Am, 2015, 97A:310-7. Femoral Radiographic Landmarks for Popliteus Tendon Reconstruction and Repair – A New Method of Reference. AWM Fok, GM Kuang and WP Yau. American Journal of Sports Medicine, 2014, 42(2):394-398. Use of a Strontium-enriched Calcium Phosphate Cement in Accelerating the Healing of Soft Tissue Tendon Graft Within the Bone Tunnel in a Rabbit Anterior Cruciate Ligament Reconstruction Model. GM Kuang, WP Yau, WW Lu and KY Chiu. Bone and Joint Journal, 2013, 95B(7):923-8. Tunnel Positions in Transportal Versus Transtibial Anterior Cruciate Ligament Reconstruction: A Case-Control Magnetic Resonance Imaging Study. WP Yau, AWM Fok and DKH Yee. Arthroscopy, 2013, 29(6):1047-1052. Distal femur rotation relates to joint obliquity in ACL deficient Chinese. WP Yau, KY Chiu, AWM Fok, CH Yan and FY Ng. Clinical Orthopaedics and Related Research, 2013, 471:1458-1464. Delay in ACL reconstruction is associated with more severe and painful meniscal and chondral injuries. August WM Fok and WP Yau. Knee Surgery Sports Traumatology Arthroscopy, 2013; 21:928-933. Osteointegration of soft tissue grafts within the bone tunnels in Anterior Cruciate Ligament reconstruction can be enhanced. GM Kuang, WP Yau and W Lu. Knee Surgery, Sports Traumatology, Arthroscopy, 2010, 18:1038-1051. Errors in Identification of the Distal Femur Transepicondylar and Anterior Posterior Axes in Minimal Incision TKR and Conventional Incision TKR – A Cadaveric Study. WP Yau, A Leung, KG Liu, CH Yan, LLS Wong and KY Chiu. Journal of Bone and Joint Surgery (British) 2008, 90B:520-6. Computer navigation did not improve alignment in a lower-volume total knee practice. WP Yau, KY Chiu, Zuo JL, WM Tang and TP Ng. Clinical Orthopaedics and Related Research 2008, 466(4):935-45. The accuracy of extramedullary guides for tibial component placement in total knee arthroplasty. KY Chiu, WP Yau, TP Ng and WM Tang. International Orthopaedics 2008, 32(4): 467 – 471. Comparison of range of motion after standard and high-flexion posterior stabilized total knee replacement. FY Ng, HL Wong, WP Yau, KY Chiu and WM Tang. International Orthopaedics 2008, 32:795-8.